With interiors that are deeply influenced by the seamless amalgamation of the rustic yet luxe nature of the Prohibition Era, The Piano Man Jazz club not only prides itself over its eclectic food menu and a wide range of cocktails, but also its creative programming schedule. Promoting artists from various genres with an underlying emphasis on jazz, The Piano Man Jazz club has has had some of the finest creatives of the music world performed there. 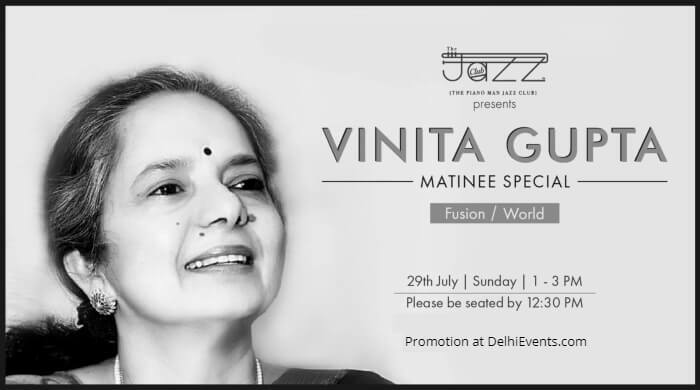 Head over to The Piano Man Jazz club this Sunday to enjoy Vinita Gupta's fusion music with melodic tunes. Vinita Gupta, a Hindustani Classical vocalist hails from the Rampur Sadarang Tradition. With a huge pool of experience from having performed at renowned classical platforms over the years, her music has the unique ability to highlight the unification of the divine and the soul. Not only a maestro of classical music, she has also worked on various fusion projects alongside her son, Vinayak Gupta, who himself is a renowned music producer, composer, as well as singer. Together, the mother-son duo released an EP called 'Inflections', featuring the best of the Delhi music circuit. 'Tore bina pita' , a popular song from the EP, gained immense recognition and was nominated in the category of 'Best Pop Artist' for the Radio city Freedom 4 awards. Vinita along with her band will be exclusively performing their creative mix of soulful music at the Piano Man Jazz Club, combining her original songs with classical based fusions, and other genres like Sufi poetry, Ghazals that has deeply influenced her music over the years. The event includes a line up of some of the most well seasoned musicians from Delhi, who each add their distinctive style to the sounds their music.